Many of the large IT research organizations and others have been telling us for some time the importance of IT alignment with the business and its objectives. Doing something the organization does not want you to do. You need to understand first of all what the organization expects from IT. If they expect IT to be a back office function simply keeping the lights on and providing support when asked, you need to be very careful about proposing IT alignment with business objectives. If the organization does not want you to align, then it could be a mistake to try. Ultimately your job is to deliver what the organization wants. Forcing opinions on the Business. Assuming aligning with the business is acceptable to the organization, you should make sure you ask the business what their objectives and goals are, and how IT can help them. I have seen cases where IT has went in with an attitude of appearing to understand the business and indeed, giving the impression they can take over the business function. This does not endear IT to the business, especially if it is headed up by a long serving professional in that business. Lack of top level support for the strategy. Don’t proceed without top level support for your strategy. This could be fatal. You can have a lot of success implementing an IT alignment strategy, but make one significant mistake and you could be the scapegoat. Make sure your strategy is documented and formally approved at the highest appropriate levels. Trying to do too much at once. The organization may be excited that IT is aligning with their objectives, but you should not set expectations too high. Any shift in strategy takes time to implement, and alignment is no exception. Make sure you plan what you can do based on current resources. If there are additional priorities, identify the resource gaps and put forward a business case to ask for more resources, temporary or permanent. Making all the decisions within IT. You should recognize that IT should not make all the decisions regarding what strategies, programs and projects to execute to achieve IT alignment. Making decisions in a vacuum without considering the risks and benefits to the organization as a whole, could result in the alienation of IT from the rest of the organization, not to mention the potential of performing activities that do not align with corporate objectives. The IT Leader can play a major role in the success of the organization as a whole. Just don’t assume that IT has all the answers. 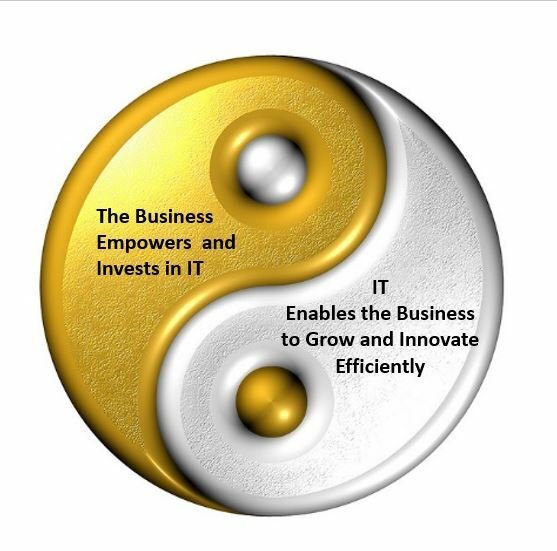 Give us a call to learn more on how to begin your IT alignment with the business process. In my next blog, I will discuss the balance of ‘keeping the lights on’, Business growth and innovation. How to keep things going yet help improve the business of the organization. Also, in the 3rd blog in this series, I will discuss the consumerization of IT and how to avoid the mistakes made by others.